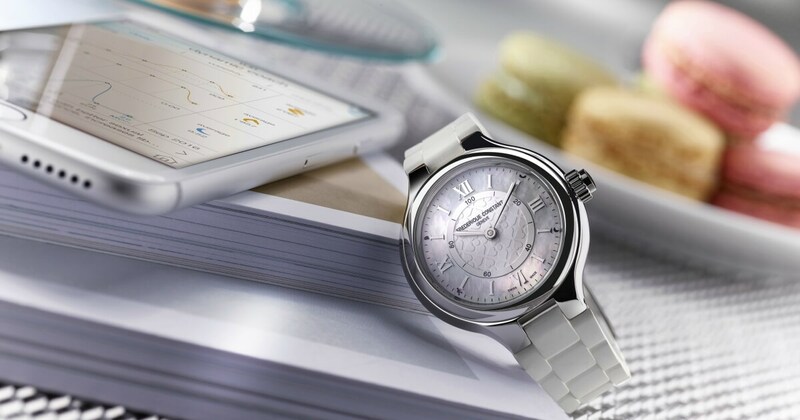 Originally launched in 2015, the Horological Smartwatch was born after three years of extensive research and development with Frederique Constant being the first in the Swiss watch industry to introduce a Horological Smartwatch, an analog watch offering connected functionalities. 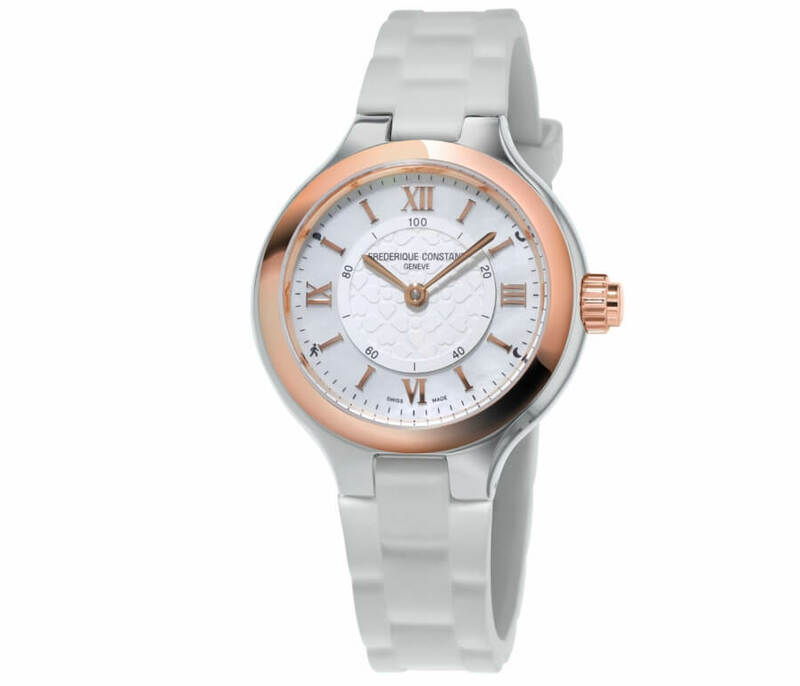 The Ladies’ versions of the Horological Smartwatch combine the two worlds of high-tech innovation with the traditional Swiss watch craftsmanship, offering a refined, elegant and feminine design watch with connected functionalities. 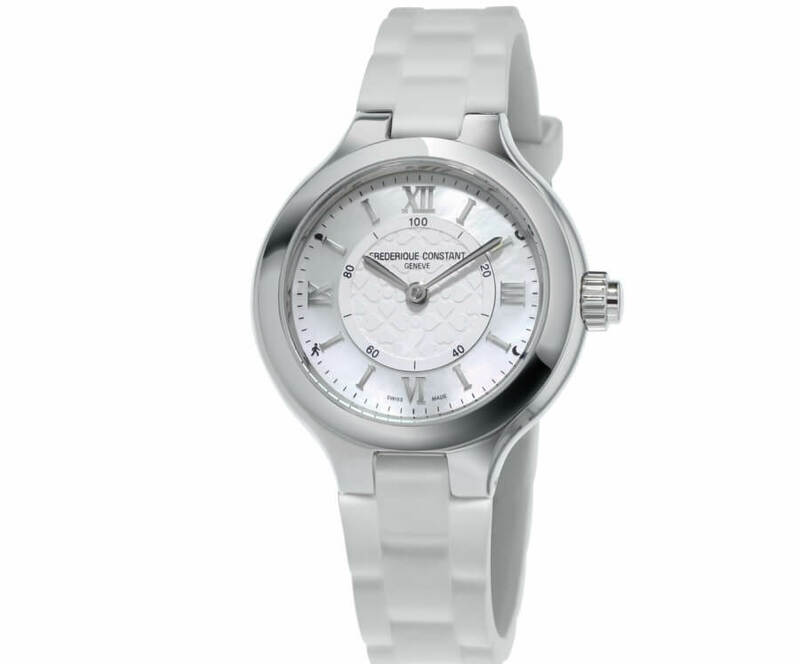 Frederique Constant’s three new Ladies models showcase intricate detailed dials featuring heart’s guilloché decoration, mother of pearl on the outer dial and applied Roman numeral indexes. The 34mm case comes in two variations; one in an all-steel version, and a second one in steel with a rose gold-plated bezel. A classic look to accompany the modern woman of today in all her daily activities from the workingwoman, to mothers and sport enthusiasts alike, motivating her to move more, sleep better, and ultimately improve her overall lifestyle. What better way than to include a new rubber strap in order to turn this classical watch into the ideal active companion. The new rubber straps, soft to touch and water-resistant, come in two different colors: white and black. The much-appreciated “activity & sleep tracking” sub-dial is featured at the center of the watch and the 2, 4, 8, and 10 o’clock positions reveal its characteristics: call notifications, sleep monitoring, activity tracking, and text notifications, respectively. MMT SwissConnect designed the Ladies MMT-281 quartz module at a smaller scale to fit the more feminine and elegant 34mm case. The module is powered by 2+ years battery life. 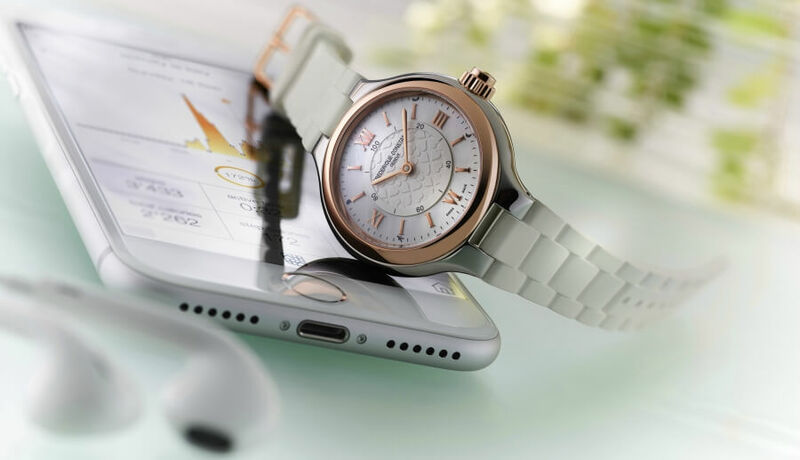 The new Horological Smartwatch carries the latest “Notify” features, namely call and email notifications. This function allows the user to be notified whenever she receives a call or an email. After connecting and pairing the watch to the MMT-365 app, calls are automatically linked to the smartwatch, then whenever the user receives a call, the watch vibrates briefly, the hour and minute hands join at 2 o’clock for 2 seconds notifying the user that a call is coming through, the same happens for the email notifications, except the hour and minute hands will point to 10 o’clock. The Horological Smartwatch has, besides the call and email notifications, features such as activity tracking, sleep monitoring, always on-time & date, sleep cycle alarm, get-active alerts, dynamic coaching, cloud back-up and restore, Worldtimer 24 time zones. Thus the smartatch keeps track of daily steps, calories burned, and total distance. If you wear your watch at night or put it under your pillow it records your sleep. Sleep tracking function provides details on how much time you spent in deep sleep, light sleep, or awake. You never have to set a time and date – traveling across time zones, the Horological Smartwatch picks up the time from your smartphone and displays new time automatically. Set a smart sleep alarm that will help you to wake up at the best appropriate time in your sleep cycle so that you wake up refreshed. Also set an alert to remind you to move if you’ve been idle for a set amount of time; you can customize your Get Active Alerts directly through the MMT-365 app. Furthermore you can receive suggestions, tips, and information catered specifically to you based on your activity and sleep goals. 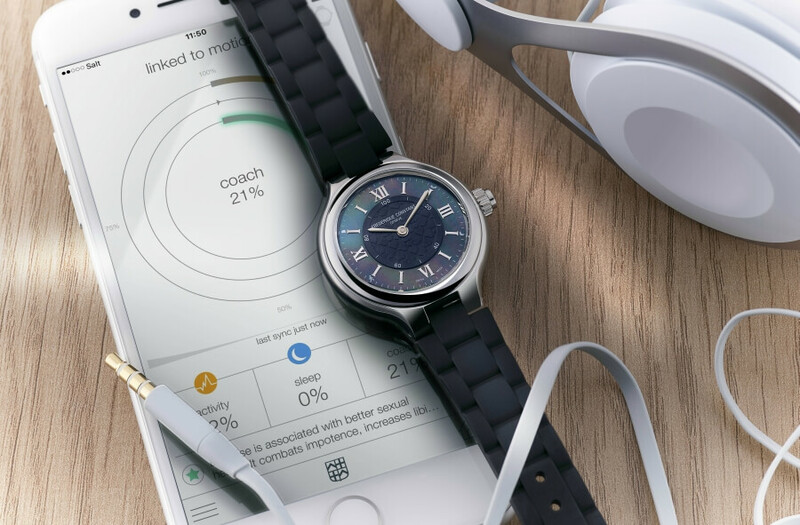 The Horological Smartwatch independently stores your activity and sleep for 30 days without having to synchronize it to your smartphone so you can recover all of your data, even if you lose your watch or phone. If you are a frequent traveler, you can keep track of your hometown’s time by simply entering your city into the app. You’ll always be able to know instantly when is the ideal time to call your loved ones or business partners back home. The new MMT-365 app which connects to the smartwatch via Bluetooth is available on both iOS and Android systems, with simple and easy-to-understand graphics to highlight how much one has moved and slept during the day, week or month.